Great news, crafters! The DC Craft Mafia's Holiday Heist application is up and ready! Wanna be part of the show this year? Apply online! Since we got such an amazing response last year, we figured why not repeat history? 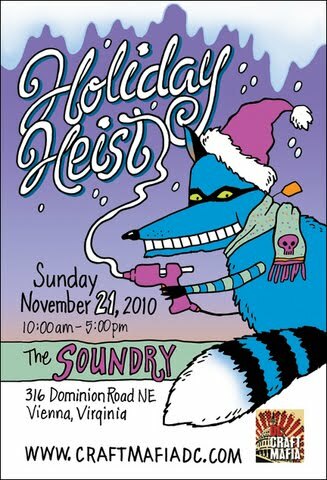 So, this year, The Holiday Heist will be held at the same place--our favorite Vienna hottspot--The Soundry on November 21 from 10 AM - 5 PM. There is a $10 application fee and if accepted, the booth fee is then $55. Hope to see you application in the mix! Ballston A&C Market TOMORROW - October 9th! I can't believe our final show of the season is tomorrow. The summer has flown by! Won't you come join us on Saturday, October 9th from 10 AM to 3 PM at Welburn Square, to visit with your favorite regulars and to meet some new artists, alike. Plus, Jane Franklin Dance will be performing excerpts from The Mouse of Amherst from 11 AM - 12:30 PM. Then, local faves, The Lynn Veronneau Triohits the Square from 1-3 PM! 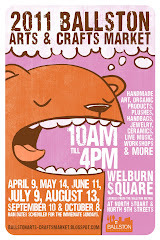 It's going to be sunny and warm tomorrow--perfect weather for an art market. So, bring the entire family to the Ballston A&C Market. Support the trifecta--Artists Dancers & Musicians.